We just returned from Bangkok and the opening of friend Victoria Vorreiter's multi-media exhibition at the Jim Thompson House and Gallery. 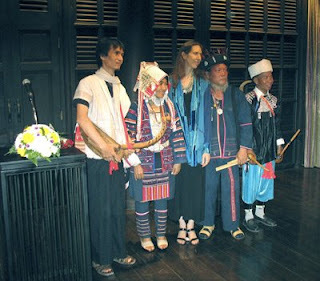 For about 5 years now she has been documenting the traditional music of the tribal groups living in the border region of Laos, Burma, and Thailand, known as the Golden Triangle. Using video and recordings, she hopes to produce a DVD later this year, but for this exhibition she prepared a CD of the music, still photographs, short video clips for each tribe, and a book. I was honored to be involved with the production of the book, which made its debut at the exhibit (cover above). At over 200 pages, it had evolved into a bit more than just an exhibition catalog and includes, in addition to Victoria's evocative prose and still photos of the tribal people, artful photos of the instruments (by Galen Garwood), and an archive showing each instrument and its pertinent details. I will have books available, so write me via our website if you're interested. culture), and a Lisu musician/dancer/performer extraordinaire. A contingent of friends from Chiang Mai also made the journey and helped out with the dressing of the mannequins. Here, the winding of a Mien woman's turban required the expertise and four hands of Nussara and Rin. 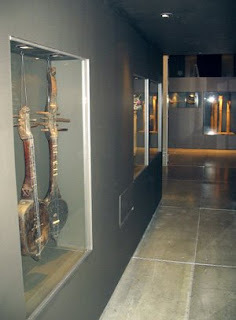 Most of the instruments were displayed in special, custom-made modules which even included drawers that opened to reveal small pieces such as mouth harps. A listening and viewing station was also included for each group. 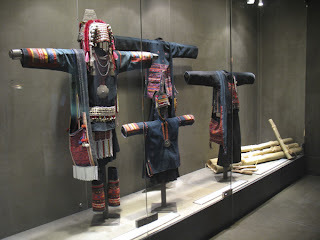 Costumes for each of the six tribes were displayed along a side wall and were adjacent to the appropriate instrument displays. 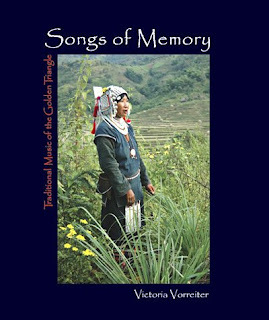 Tho Victoria has documented the music of more groups, this exhibition and book were limited to the Karen, Hmong, Mien, Lahu, Akha, and Lisu. 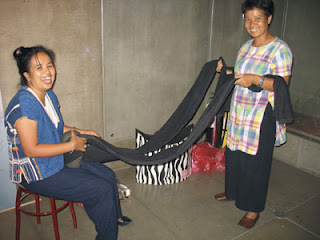 In the photo below, on the right, are Lisu tseubeu in the case with Karen harps and clothing in the background (Lisu costumes are to the left, but not in the photo). 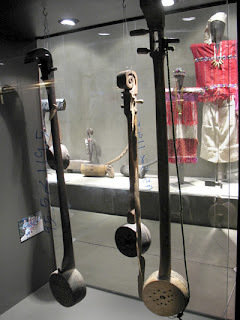 Below, to the left, are shown Lahu free reed pipes in the cabinet, with their clothing and a bossed gong along the wall. 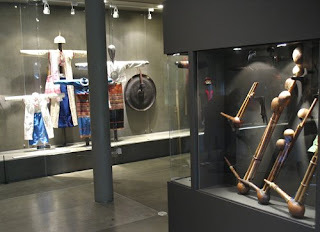 A group of Akha outfits are below, with the large bamboo beaters used by hunters in the corner. 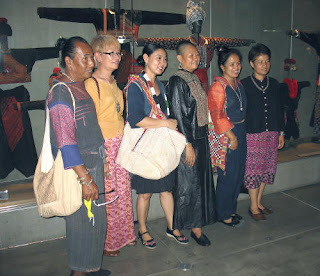 Many attendees wore tribal dress, and the group of friends below showed off a variety of ethnic attire and accessories from different places in the region including China, Burma, Laos, Thailand, and even India. 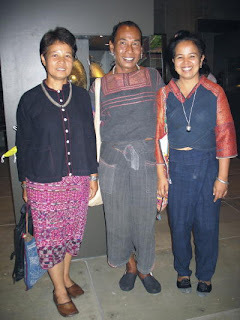 Below, Rin, Dtoy, and Nussara are resplendent in Hmong/Miao and Mien pieces from China and Thailand. For more information on Victoria's current project, and a past one on the traditional music of Morocco, go to her website. The photo galleries are a real treasure trove of tribal people, their clothes and milieu. Also see the Jim Thompson House website for information about the exhibition and more photos. This 'must-see' show will be up until 23 July, 2009, so if you find yourself in Bangkok, don't miss it. It's deja vu all over again. A little over four months after the last uprising against 'the Government' we now have people in red shirts wreaking havoc in Bangkok, not unlike that wrought by people in yellow shirts back in November and December, and with the same goal- that of overthrowing the current government. At least these folks haven't taken over the airports. But they might as well have, considering the blow made to Thai tourism. First, they broke thru the lines of soldiers providing, albeit lackadaisically, 'security' to the ASEAN summit meeting in Pattaya, and then broke into the hotel and completely disrupted the impending summit session, forcing it to cancel and the regional national leaders to leave by helicopter. Taken to a nearby military base from which they left for their home countries, the leaders will no doubt have second thoughts about visiting Thailand again. To say that Thailand, and the PM, have suffered a huge embarrassment is an understatement. Empowered by the 'success' of their Pattaya adventure, the red-shirted protesters went back to Bangkok and took over key intersections, along with attempts to take over the Interior Ministry and Government House. They called for 'open season' on the PM and other members of Parliament and, in the attempt to 'catch' the PM, managed to inflict serious injury to members of his staff, justifying their zeal with slogans and speeches about "real democracy" and the overthrow of this illegal government. To anyone not keeping up too closely, this is really confusing-- it sounds just like what went on late last year, but the color du jour then was yellow. This year, the yellow shirts have been put away since the old government in fact captiulated and the new government was basically to their liking. Now in office for a few months only, the new government is under threat by the sour grapes faction that liked the old government and is being encouraged and funded by exiled former PM Taksin Shinawatra. Sporting red shirts, it has gathered strength from all the poor and disenfranchised around the country, especially the north and northeast. So, what is the next color to find favor, you ask? We don't know, but we are wearying of the childish, but dangerous, behavior that is being encouraged by the lack of accountability. To give in to this mob rule only empowers and rewards simplistic political thinking. These mobs do not represent the majority and their tactics are in no way democratic. We have heard from several sources that many of these protestors are well-paid. The timing is also carefully considered, as many are off work for the Songkran/Thai New Year vacation, and are available for these extra-curricular activities. Had this type of behavior been dealt with the last time, when the perpetraitors wore yellow, the new perpetraitors in red might have given more thought to their actions. It seems to be a vicious cycle of colored shirts, each doing their part to undermine their country, all mis-using and abusing the term "democracy". When will it end?! ?